What is it? Known by various names in many languages, including “ba guan” in Chinese and “hijama” in Arabic, cupping therapy is an ancient practice that has been widely practiced for over 1500 years throughout Europe, Africa, Asia, the Middle East and South America. Various cups can be used that are applied directly on the skin via suction: animal horns, bamboo, ceramic, glass, silicone and plastic. In China, the most common are glass and bamboo cups. In the West, the most common are glass, plastic and silicone. When glass cups are used, the vacuum is created in the cup using flaming cotton to burn the oxygen inside the cup (top image). However, this method produces unpredictable amounts of suction, and can sometimes cause minor skin burns. Newer, but thinner glass cups are available that come with an attached pump to it (left image), but separating the parts is too difficult to allow for proper cleaning, disinfection and sterilization. Many TCM practitioners in the West use plastic and silicone cups. Plastic cupping sets use a mechanical hand pump to create the vacuum. Silicone cups use a simple push-top to create suction and are malleable for use over non-flat surfaces like small joint areas. The benefit of using cups made from plastic and silicone is that the exact amount of suction desired can be created. Cups are usually left in place 5-15 minutes before being removed and applied elsewhere. It is typically the large soft tissue areas that are cupped such as the back, neck and shoulders, but it may also be done on the arms and legs or around the large joints of the body. Depending on the purpose and strength of the cupping, the effect is that underlying tissue is drawn up into the cup and may redden or purple the local area to make it look bruised. These marks are not dangerous and disappear in 3-10 days, depending on the level of toxicity and the efficiency of the person’s lymphatic system. How does it work? By creating a vacuum of reduced oxygen within a cup over the skin, tissue is drawn into the cup, acting on tissue up to 4 inches within the body. Depending on the application, the effect of cupping can be: deep tissue massage, relaxation, skin rejuvenation and tightening, detoxification, stimulation of local area blockage, activation of lymphatic system, activation of whole body circulation, immune system boosting, removal of blocked wind, cold, damp or heat pathogens and “dirty” blood (i.e. accumulation of old dead, or acidic blood). 1. Light cupping – weak suction is used in the cup. This is suitable for children and very elderly or very weak people. 2. 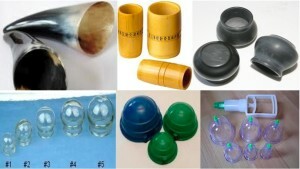 Medium or strong cupping – suction is medium to strong for general purposes. 3. Sliding cupping – a relaxation method that requires applying oil to the skin and moving the cup on the treated area using light to medium suction. This is useful to relax very tight muscles and myofascia connective tissues. It is also the method most useful for dealing with cellulite. 4. Needle cupping – acupuncture and cupping are done together over the same place by applying the needle first, then the cup over the needle. The cup must be tall enough to allow for the needle handle to fit easily within the cup. 5. Wet cupping – compared to the previous four which are all forms of “dry” cupping, “wet” cupping is the oldest, most frequently used and often the most effective method (see below). The more toxins that are held in the body and the poorer the circulation, the darker the marks. The skin will discolour to look dark-red, purple, or bright red with freckle-like marks. These are not bruises. These marks may be tender the first 24 – 48 hours or so after cupping, but with hot baths using epsom or himalayan salts, any marks or tenderness disappear quickly. 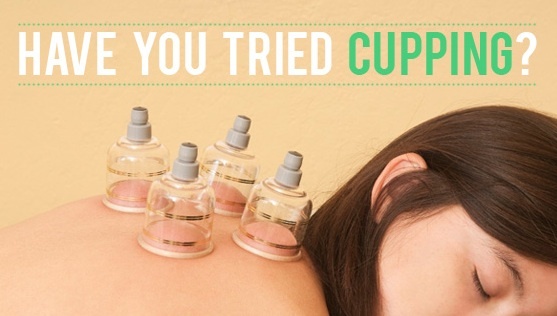 For some people showing extensive toxins in their body, “wet” cupping may be indicated. Wet cupping is a type of controlled bloodletting by making small pinprick incisions into the skin that feel like ant bites. The area is then cupped again and because the vacuum in the cup generates a pressure differential, toxins are drawn out of the body through the tiny skin scratches. Since blood is the primary medium by which toxins are carried, it is toxic, acidic or dead blood that is released. The body naturally stops the controlled bleeding when toxins in the local area of tissues have been sufficiently released out of the body. There is a particular technique for wet cupping to be effective. And certain locations on the body should be wet cupped for specific conditions. For example, wet cupping should be performed after initial “dry” cupping is done first (below image). If this step is missed, toxins are not drawn up to the skin surface and the effects of wet cupping are far less beneficial, and not long-lasting. When performed correctly, wet cupping releases inflammation and swelling, as well as acidic, dead stagnant blood from the body. When the body’s systems get clogged up faster than it can eliminate blockage, then over time, pain and disease manifest or worsen. Who should avoid it? Those who are taking strong blood-thinning medication (baby aspirin is fine), have bleeding disorders such as hemophilia, have a pacemaker, and those who are already extremely weak such as post-surgery individuals or post-delivery women are all cautioned not to receive cupping. Also, given that cupping strongly stimulates blood circulation, it is not suggested for pregnant women or else miscarriage can occur. Cupping the scalp of the head may also not be recommended for those with high blood pressure. Who can it help? Cupping can help those with arthritis, lower back pain, gout, frozen shoulder, sports injuries, asthma, allergies, common cold or flu, chronic cough with mucus, acute or chronic pain, digestive issues, headaches, migraines, neck pain, menstrual pain, eczema, depression, fibromyalgia, high stress, overall health maintenance, and much more. For research articles on all types of cupping therapy, visit Cupping – All Types.